Call (02) 9831 2111 for enquires or order by phone! 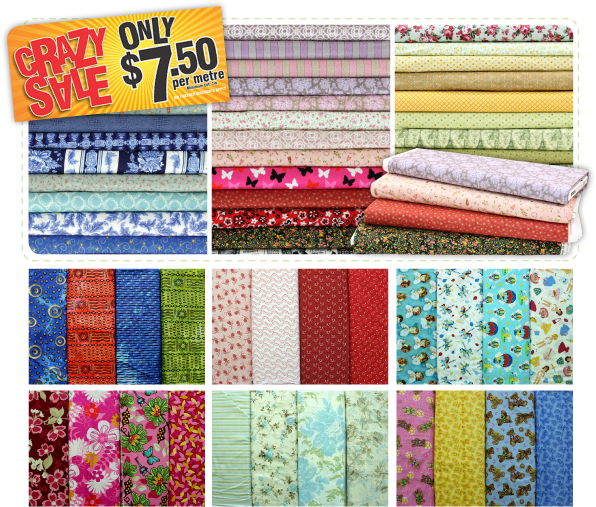 $7.50 per metre fabric sale! Available in stores ONLY – Fabric ranges vary from store to store – No further discounts apply – Not available in conjunction with any other offer – Minimum cut: 1m. New products arrive every week... fabrics, furniture, storage solutions, tools and accessories. If it is crafty, we'll more than likely have just the thing you are looking for. You might like to buy a Gift Certificate for someone who is passionate about craft. Redeemable online, they are perfect gifts. If you have any enquiries, feedbacks or complaints, please click here to contact us.